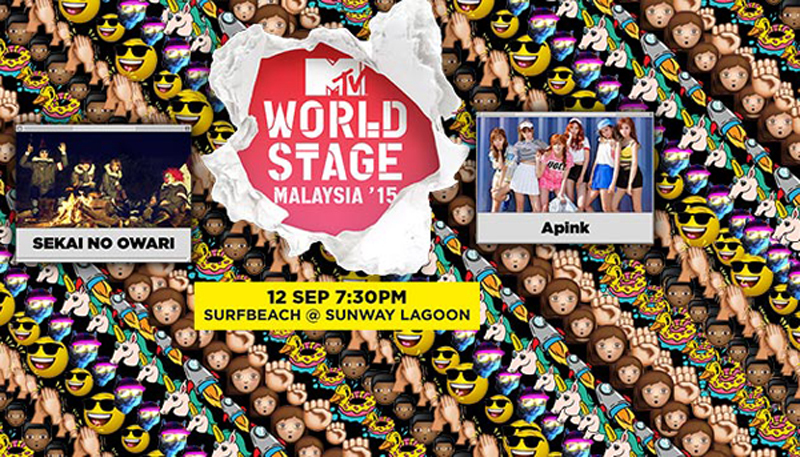 KUALA LUMPUR/ SINGAPORE, 22 JULY 2015 – MTV has revealed its first wave of performers today with Korea’s favorite K-pop idol female group, A-Pink and hottest Japanese band, SEKAI NO OWARI to perform for the first time at MTV World Stage Malaysia, which is set to take place at Surf Beach, Sunway Lagoon on Saturday, 12 September 2015. Recorded live for global telecast, the one-night only outdoor event is one of the biggest Southeast Asia music nights of the year, which brings multi-genre talents onto a single stage. More acts will be announced in the coming weeks. A-Pink is currently one of the most idolized K-pop girl groups formed by A Cube Entertainment in 2011. Known for their sweet and innocent image and street style that has captivated fans around the world, the award-winning group consists of Park Cho-rong, Yoon Bo Mi, Jeong Eun-ji, Son Na Eun, Kim Nam Joo, Oh Ha Young.